One day, looking through a stack of pre-stretched canvases at home, I came across a round, 16" diameter canvas. I thought it might be interesting to paint something on it… and a moment later, I realized it reminded me of the physicality of a large coin. A grouping of coins seemed more appealing than just one, so I decided upon five... with the smallest value, being the smallest canvas… and the largest value being the largest canvas. 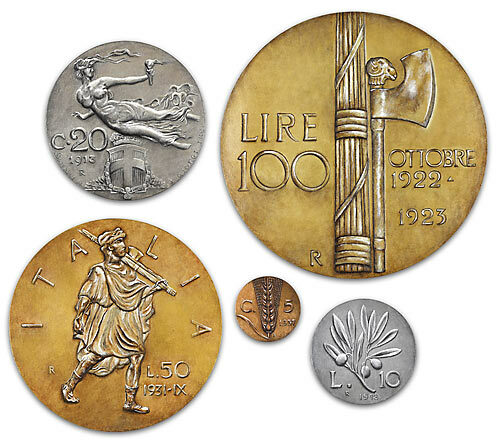 The choice of old Italian coins is a vintage look back to my heritage… and the October 1923 coin is significant, as it is the month and year of my father&apos;s birth. Monete is being offered as a giclée on canvas print (all 5 coins grouped together on one canvas, as seen above), with a limited production of 75 signed and numbered prints. The canvas measures 26" x 30"